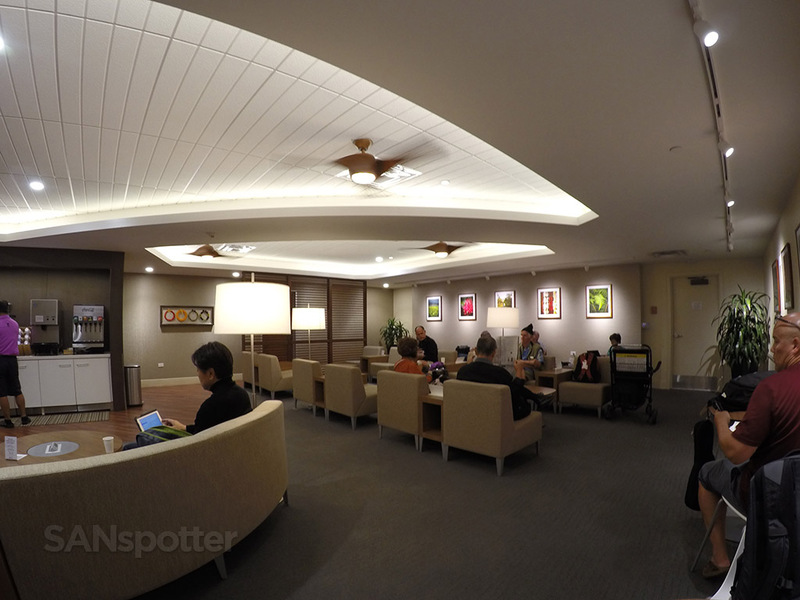 For some reason or another I hadn’t even planned on seeking out this lounge at HNL while waiting for my flight back to SAN. You see, I really like the Honolulu airport and I can easily spend hours walking back and forth along the outdoor corridors looking at all the interesting aircraft from Asia and the mainland US. This is a very busy airport, and those outdoor walkways between terminals are really nice. I think part of the reason I like them so much is that I consider them to be giving me the last little bit of that Hawaiian fresh air before getting on an airplane and calling an end to my vacation. 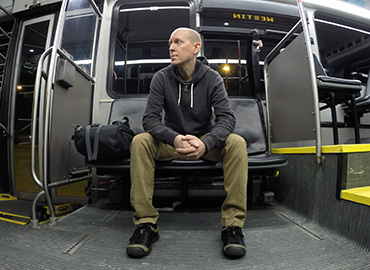 Leaving HNL has never been easy for me. 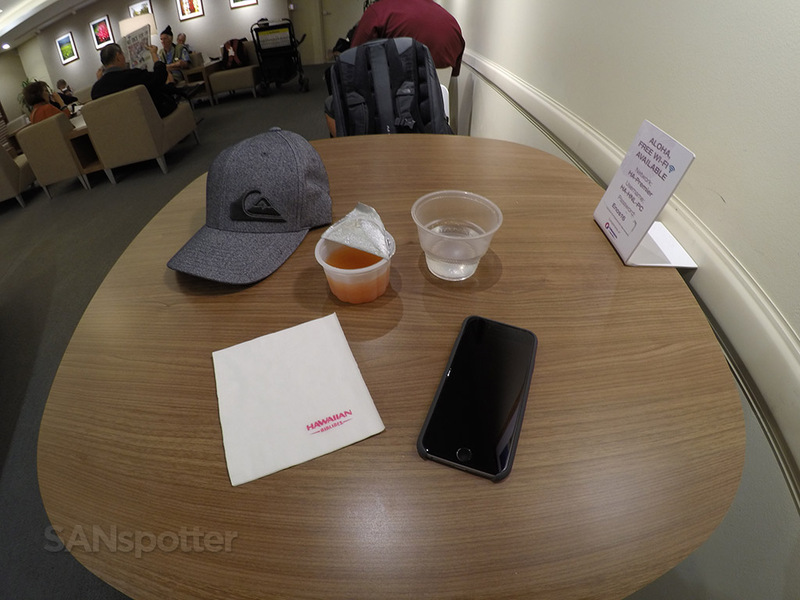 But I did have a lot of extra time on this particular trip, so I decided to see what the Hawaiian Airlines Premier Club was all about. Problem was, it wasn’t all that easy to find. 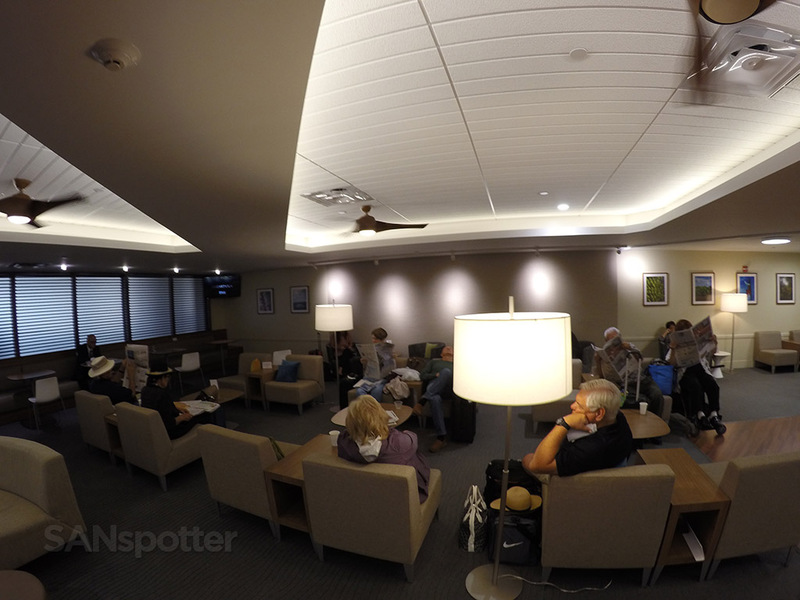 To make it even more confusing, there are actually two kinds of Hawaiian Airlines lounges – one for international passengers, and the other for domestic (intra island and mainland) flights. I didn’t know which one was which simply by looking on the map hanging on the wall inside the terminal, but I just decided to go to the nearest one to see if they would let me in. 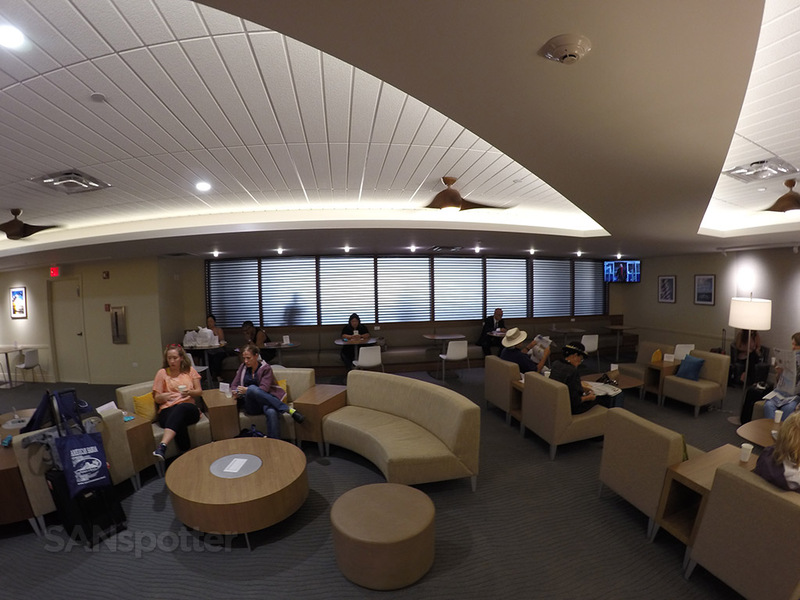 It turns out that I visited the international lounge first – which was about midway down the Hawaiian Airlines inter-island terminal on the second floor. There wasn’t any signage or labels indicating it was for international first class passengers only, so I had to go inside and ask. While standing at the main desk to wait for assistance, I had a quick look around. To be honest, I wasn’t really impressed. Yes, it was quiet, but it was simply one big space that looked more like a waiting room at the doctors office more than anything else. 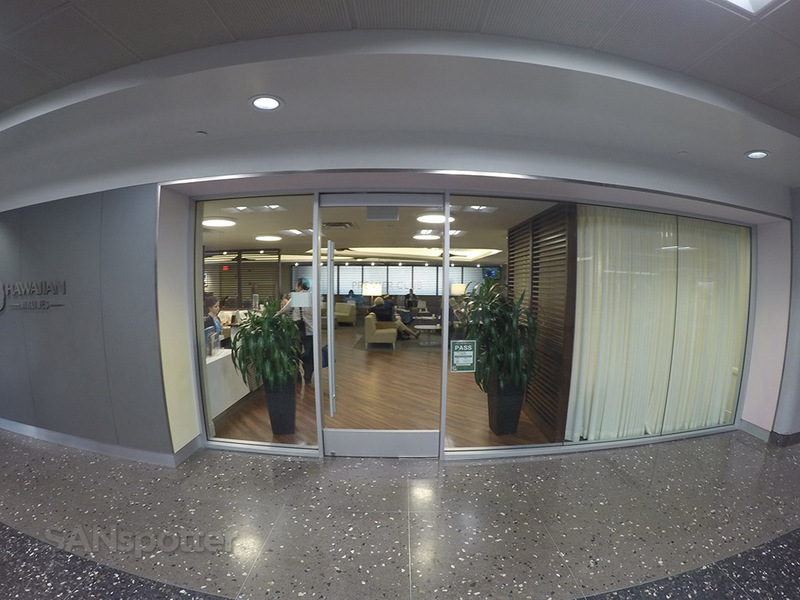 I was quickly told that the other lounge (located near the end of the terminal) was the one I could use, and she did her best to give me directions. It sounded clear to me at the time, so I trotted down there assuming it would be right there where she said. It wasn’t. I won’t bore you with the details of how hard I looked for this lounge, but all I’m going to say is that it might behoove the airport personnel to add a bit of colorful signage pointing the way! Once inside, I noticed two things. First, it was busy! So busy in fact that I wasn’t even sure that I would be able to find a place to sit. 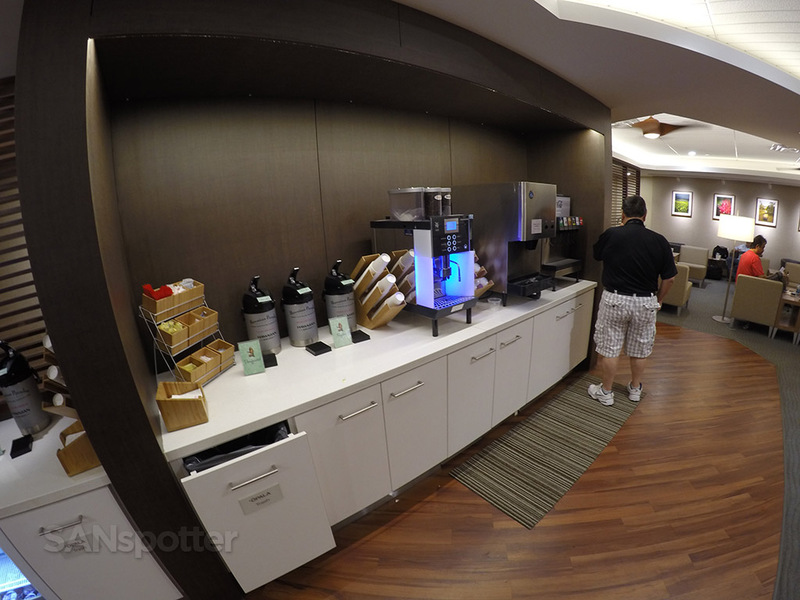 The second thing I noticed was that I thought it actually looked better than the international lounge. The space was divided into two main sections, with nice ceiling textures and rich materials throughout. 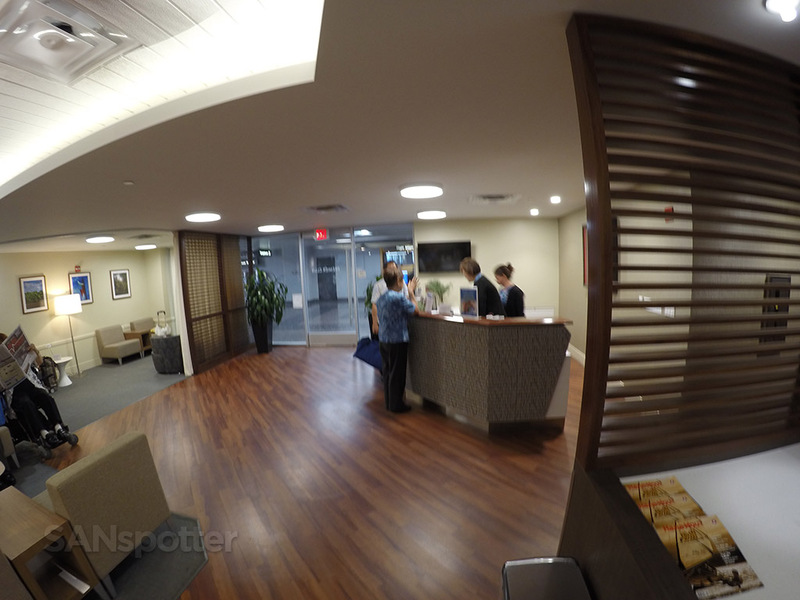 It was nowhere near the nicest airline lounge I’ve ever been to, but this Premier Club was pretty decent in my book. 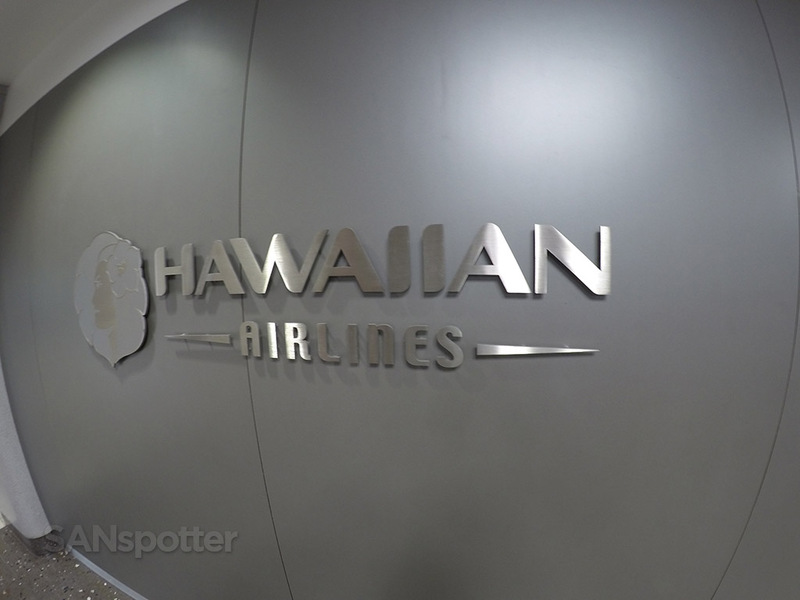 One of my favorite things about the Hawaiian Airlines brand is the logo. Very classy. 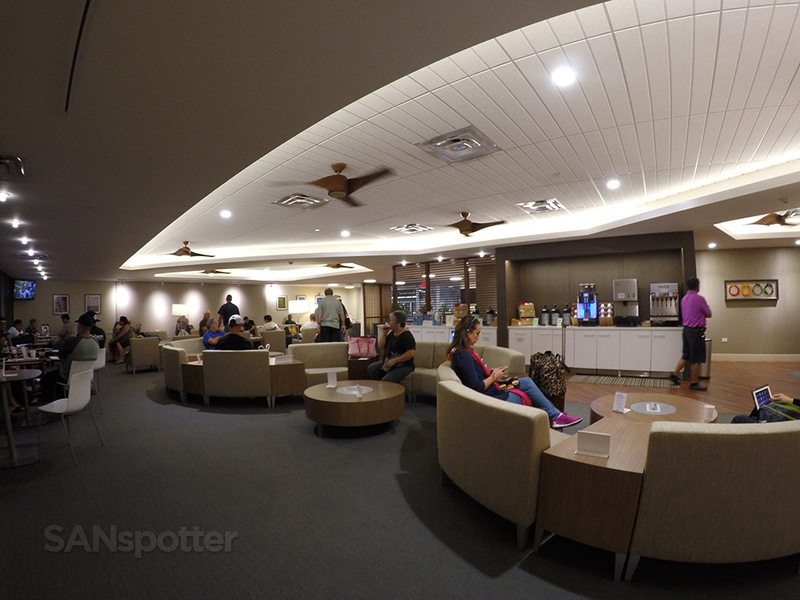 It’s a decent size lounge, though the seating configuration is a bit more on the “social” side and not ideal for solo travelers IMHO. The beverage section was far better stocked than the snack section. There is very little food to be found in this lounge. 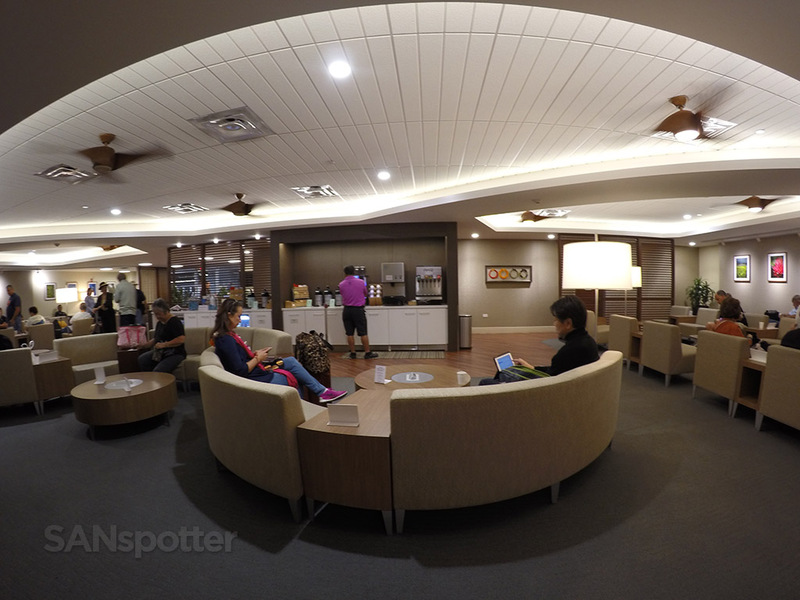 All in all, I found this lounge to be a rather nice escape from the hustle and bustle of the inter-island terminal. It was very noisy and crowded out there, but inside everyone seemed to be on their best behavior and it was as quiet as a library. Food selection was rather weak IMHO, but to be honest I wasn’t expecting anything otherwise. I wouldn’t have eaten anything anyway since I knew I would be eating well on the flight home to San Diego. 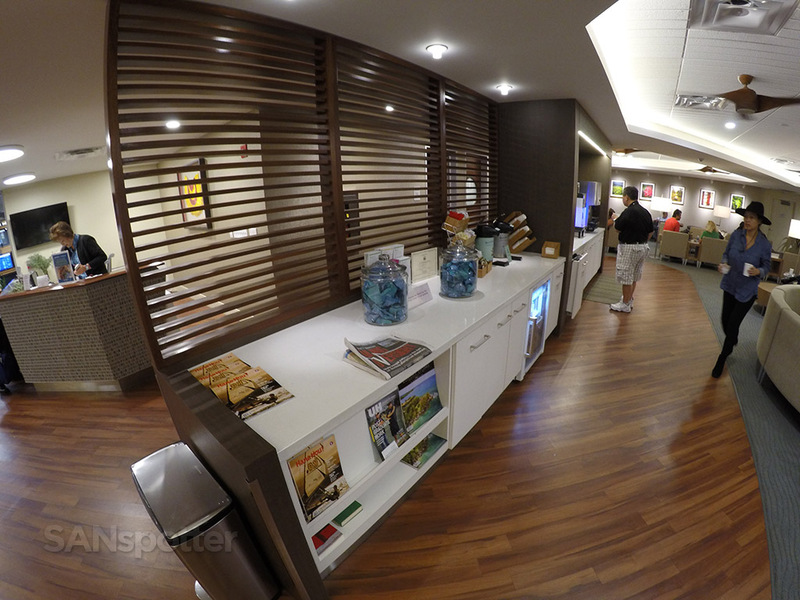 One of these days I’m going to do an international flight through Honolulu just so I can try the premium lounge. I didn’t look as nice, but there’s only one way to find out how good it really is!